Nosebleeds are very common in young children, affecting most at some time or another. From the outset, it is important to be aware that nosebleeds will often settle down on their own, sometimes requiring medical treatment, but that major underlying causes (blood clotting problems or abnormalities in the nose) are very rare. This information page explores the causes and treatments of nosebleeds in more detail. The nose acts as a radiator, to warm and moisturise the air which we breathe in, so that the lungs receive warm and humid air, rather than cold and dry air from the environment. In order to achieve this, the nose is full of small blood vessels and is lined by a delicate, moist mucus-producing lining. Anything which irritates this delicate nose lining may then expose underlying blood vessels, which start to bleed. Nosebleeds most often occur at the front of the nose. The air which we breathe in is still quite dry and turbulent in this area, which tends to make the nose lining quite dry and crusty. This is particularly common in young children. At the same time, several groups of blood vessels come together in this area, at the front end of the nasal septum (the cartilage partition in the middle of the nose which separates the two nostrils). This is called the Little’s Area. The combination of prominent blood vessels in this area, dryness and crusting from dry, turbulent air, and nose picking (or inadvertent rubbing of the nose) may therefore expose blood vessels and start nosebleeds. This is the most common way in which nosebleeds occur, which we therefore call “simple” nosebleeds (or simple epistaxis). Sometimes, bleeding starts from other areas in the nose, including further back. There may be some crooked areas in the nose which produce air turbulence and drying, again exposing blood vessels. Lumps and growths within the nose are rare, particularly in young children, and nosebleeds are seldom caused by these. However, repeated one-sided nosebleeds with nose obstruction and blockage on the same side may point to a lump in the nose, and the nose should therefore be thoroughly examined with a small telescope (endoscope) if this is the case. Blood clotting problems are rare reasons for nosebleeds. It is also rare that children will have reduced blood levels (anaemia) as a result of nosebleeds. Blood tests are therefore usually not necessary in children, unless there is a history of persistent nosebleeds in spite of treatment, bleeding or bruising tendencies elsewhere, or a family history (in parents or siblings) of such problems. So, in summary, most children’s nosebleeds are caused by simple dryness and crusting at the front of the nose, and they will eventually settle down with simple measures. Other underlying causes are rare, but may be investigated if bleeding is persistent or there are other unusual features. Knowing how to pinch the nose properly and stop a nosebleed is very important, and often done incorrectly. Remember that the bleeding usually starts at the front of the nose. The best way to stop a nosebleed is therefore to pinch the soft part of the nose firmly with a finger and thumb- as you would when jumping into a swimming pool. This will put pressure on the bleeding blood vessels, and therefore help them to clot off. At the same time, something cold (a bag of peas or ice pack in an old T-shirt) should be placed on the forehead or back of the neck. This will encourage large blood vessels in the head and neck to close down, reducing blood flow to the nose. Sitting forwards will also help blood to clot at the front of the nose, rather than running down the back of the throat, which is often unpleasant. The nose should be pinched continually for 10-15 minutes. People will often stop pinching too early, dabbing the nose with a tissue to see if the bleeding has stopped. This will disrupt the blood clotting, and prolong bleeding. Similarly, the temptation to put a piece of tissue paper (or anything else) up into the nose should be resisted: this will further traumatise the delicate nose lining, again making further bleeding more likely. Firm, persistent pinching for 10-15 minutes should do the trick. In rare cases where the bleeding is very heavy and does not stop after 30-45 minutes, then medical attention should be sought. In these cases, a bleeding point might need to be cauterised by an ENT specialist, but this is unusual- simple measures usually suffice. Once the first aid measures have stopped the bleeding, the nose must be treated carefully over the next few days, to allow the delicate bleeding point to heal properly. Avoid nose rubbing, picking, dabbing with tissues or vigorous nose blowing: the nose is sensitive, and should be treated as delicately as the eyes. Heavy exercise, exertion, hot baths/showers and spicy foods should also be avoided for 10 days or so. These will tend to increase blood flow to the face and nose, again making further bleeding more likely. Be prepared that bouts of nosebleeds tend to occur in clusters. It is therefore very common to have a few nosebleeds occurring over several days before everything finally settles. The simple first aid measures can be used each time. Bactroban nasal ointment. This contains mupirocin (an antibiotic) and a Vaseline base. Both of these work very similarly, helping the nose to heal and reducing bacteria in the nose (which slow healing). They should be applied carefully to both sides of the nose two to three times a day for two weeks. The best way to insert the cream/ointment is to gently put the nozzle into the nostril, pointing the tip away from the nasal septum- so that this delicate part of the nose is not further traumatised. Squeeze a pea-sized blob into each nostril, and a little sniff or a gentle pinch of the nose should help disperse it into the nose. A finger, cotton bud etc should not be used to insert the cream/ointment, as this may injure the nose and provoke more bleeding. These preparations can be used repeatedly, in parallel with first aid and aftercare measures, bearing in mind that repeated nosebleeds are very common. It is seldom the case that nosebleeds persist despite the above measures. Sometimes a prominent vessel may be responsible for repeated nosebleeds (usually on one side of the nose). In these circumstances, and where the other measures have failed, cauterisation of the nose may be necessary. This involves using a little stick, a bit like a cotton bud, with a chemical called silver nitrate at the tip. This is applied to the prominent blood vessel(s) for a few seconds. The chemical mixes with moisture in the nose, forming a tiny blob of acid which scars a very small area of the nose lining, cauterising the blood vessel(s). This can be a little sore, so some local anaesthetic is often sprayed into the nose beforehand. Additionally, the chemical reaction produces a black residue which can stain the skin. Vaseline should therefore be smeared around the nose and upper lip before the procedure, and any excess of residue should be rinsed off with a wet tissue in the hours after cauterisation to avoid skin staining. 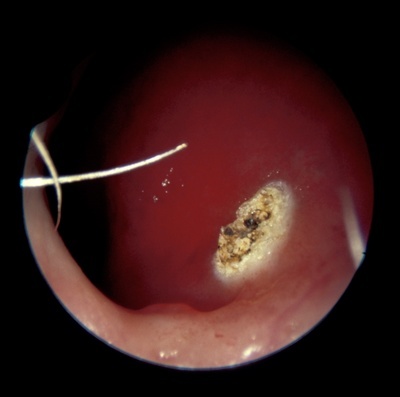 Cauterisation may rarely damage the septum of the nose, and so should be done sparingly, only when necessary and on one side only, to minimise these risks. It is also common that cauterisation, like other treatments, works for a while before other vessels appear and nosebleeds start up again. The same measures should be used again, in a step-wise fashion. It is often helpful to examine the nose with a small telescope (endoscope), allowing the whole inside of the nose to be checked for bleeding points, particularly when bleeding has been persistent or repeated, where there is nasal obstruction, and where no obvious blood vessels can be seen at the front of the nose. This is usually not possible in toddlers or very young children, who may not cooperate, but can be done in clinic from age 5 (or so) onwards. The nose is usually sprayed with local anaesthetic beforehand, which makes the examination more comfortable. These are reserved for children with heavy bleeding, persistent nosebleeds, signs of anaemia or bleeding or bruising elsewhere, and those with a family history of clotting problems. Some local anaesthetic cream (magic cream) or cold spray may be used to make this more comfortable. The main tests are a full blood count (FBC) and clotting screen. Nosebleeds in children are very common. They tend to occur in clusters, and are often repeated (recurrent). They are rarely dangerous in any way, and will usually settle with time. Correct first aid measures are essential. Antibiotic nose cream or ointment will also help. Cauterisation of the nose is seldom required, as long as the simple measures have been used properly. Some children with unusually severe symptoms require further investigation, but this is not normally required. An excellent evidence-based review article all about childhood nosebleeds is available by clicking here.